ALL AGES who struggle with reading. —Millions of students, many of those with 20/20 eyesight, have unidentified EYE TRACKING and VISION PROCESSING problems that interfere with their success in school. —Did you know being left-eye dominant (LED) can contribute to reading difficulty? —Parents, educators, and home school teachers value EYES ON TRACK ™ as a tool to identify learning problems in the classroom. —This breakthrough book includes valuable information for left-eye dominant (LED) students, observation symptom checklists, a new "easy to learn" Detection Screening, and 2 chapters of fun VISION PRACTICES to improve students’ EYE TRACKING and VISION PROCESSING skills. Why do so many students seemingly fail to achieve their full potential? There’s a reason so many parents and teachers get frustrated with their students’ difficulties. 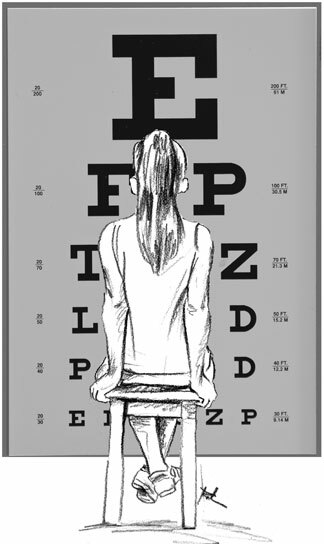 Invented in 1862, the Snellen eye chart is still in use today to test eyesight at a distance of 20 feet. This chart fails to test “EYE TRACKING and VISION PROCESSING” skills that are essential for reading. Kristy Remick, OD, FCOVD, FAAO, is a Developmental Optometrist that wants to share her experience of over 30 years helping students overcome EYE TRACKING and VISION PROCESSING problems. Dr. Remick is currently a full-time Associate Professor at Western University of Health Sciences College of Optometry in Pomona, CA where she has developed and supervised vision screening of over 21,000 children in the school district vision program. Dr. Remick is actively involved in scientific research studying visual deficits and effective treatments. Dr. Remick’s career goal is to make a positive impact on education by “shedding the light” on the TRUE meaning and purpose of VISION in the learning process. 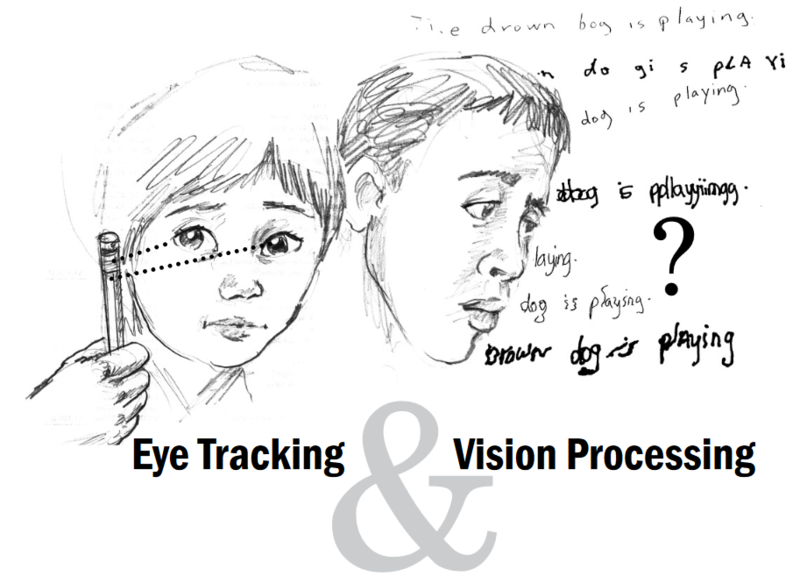 Eye tracking and vision processing skills, provide a foundation for learning. If undetected, students struggle and assume they’re ‘not smart’. This leads to frustration, behavior problems and academic failure. Eyes On Track; Ages 4 – Adult is a user-friendly guide designed for teachers, parents, and anyone who has the privilege of working with children in a learning context. Teachers, child study teams, and administrators are overloaded with responsibilities. Their first reaction, when new ideas and methods are introduced, is to run and pull the covers over their heads. "No more", they are thinking. "I could not possibly add more to my day." The last chapter of the book is comprised of bits of wisdom that break this eye tracking practice down into manageable small bites. Making this doable is key, and the time spent launching this innovative approach will be a worthwhile investment that will yield unprecedented results with improved reading, and change lives. This innovative new book offers “practices” that will beuseful to older students and adults as well, who perhaps struggle with the effects of untreated visual deficits that went unrecognized in their childhood, or they are dealing with stress on the visual system that is a result of screen-heavy behaviors and practices. An awesome book-Valuable to ALL teachers and parents. As a teacher, I have seen tremendous results in my students from improved vision skills; it is exciting to have Eyes On Track ™ ” activities to use in my classroom. Once my son developed improved eye tracking and vision perception skills, he performed so much better in school and his self-esteem improved dramatically. He is a different person now; it changed his world! 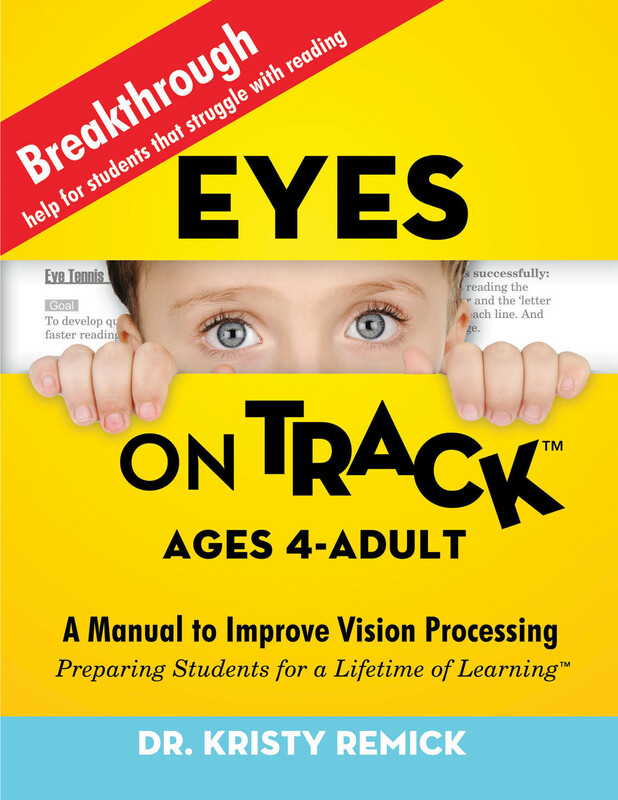 I have long awaited a book like Eyes On Track ™ that school professionals as well as parents can use to understand the nature of near vision problems and their effect on learning. This book goes even further in that it provides therapeutic techniques to be used in the classroom. I recommend this book for all professionals and parents working with children who are academically-challenged. This book offers interventions for students who have their own style of learning.